The ring-like swirls of dust filling the Andromeda galaxy stand out colorfully in this new image from the Herschel Space Observatory, a European Space Agency mission with important NASA participation. The glow seen here comes from the longer-wavelength, or far, end of the infrared spectrum, giving astronomers the chance to identify the very coldest dust in our galactic neighbor. These light wavelengths span from 250 to 500 microns, which are a quarter to half of a millimeter in size. Herschel's ability to detect the light allows astronomers to see clouds of dust at temperatures of only a few tens of degrees above absolute zero. These clouds are dark and opaque at shorter wavelengths. The Herschel view also highlights spokes of dust between the concentric rings. The colors in this image have been enhanced to make them easier to see, but they do reflect real variations in the data. The very coldest clouds are brightest in the longest wavelengths, and colored red here, while the warmer ones take on a bluish tinge. These data, together with those from other observatories, reveal that other dust properties, beyond just temperature, are affecting the infrared color of the image. Clumping of dust grains, or growth of icy mantles on the grains towards the outskirts of the galaxy, appear to contribute to these subtle color variations. These observations were made by Herschel's spectral and photometric imaging receiver (SPIRE) instrument. The data were processed as part of a project to improve methods for assembling mosaics from SPIRE observations. Light with a wavelength of 250 microns is rendered as blue, 350-micron is green, and 500-micron light is red. Color saturation has been enhanced to bring out the small differences at these wavelengths. 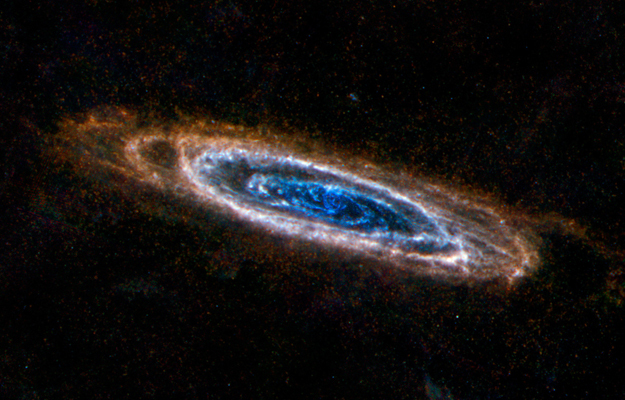 Image credit: ESA/NASA/JPL-Caltech/NHSC. Larger images.